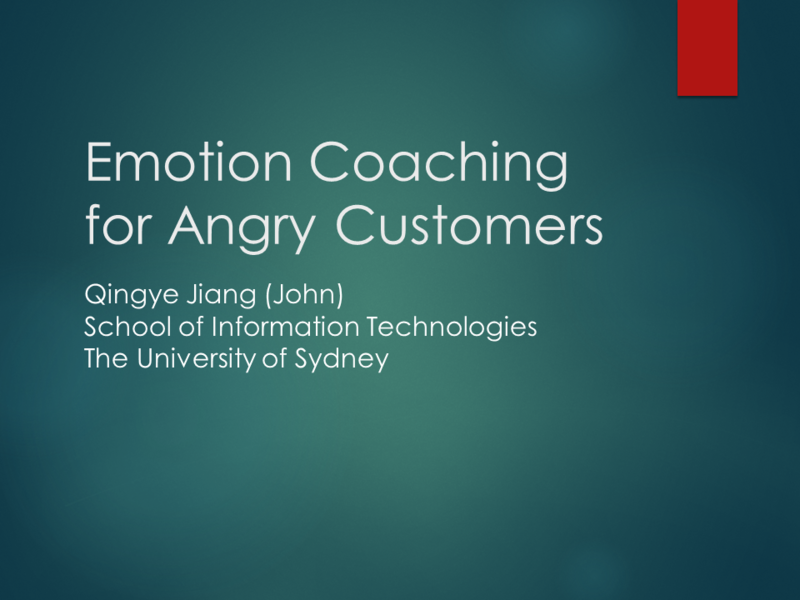 This is a set of slides that I prepared on the topic of “Emotion Coaching for Angry Customers” for customer facing roles. I am making them publicly available so that more people can benefit from this work. You are more than welcome to use them to provide training to employees in your own organisation, provided that you preserve the original author information. 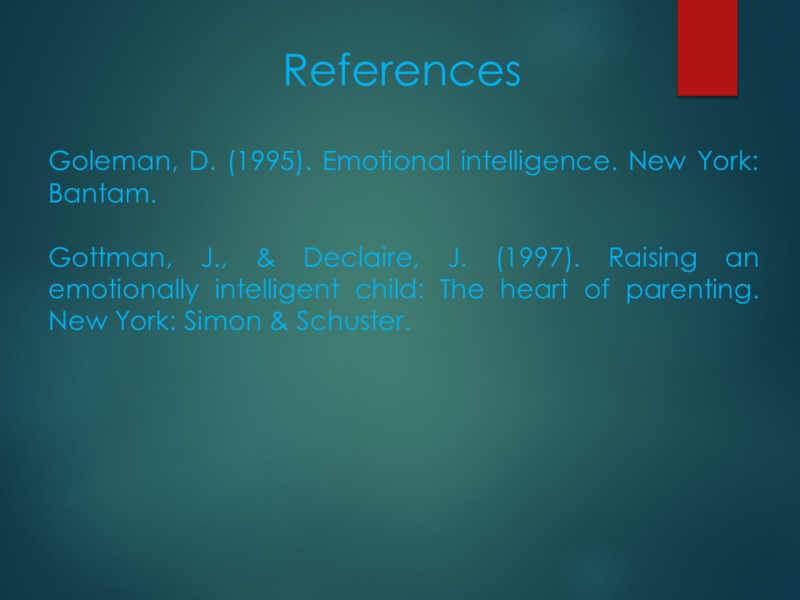 If you need the original PowerPoint files, please drop me a note and I would be more than glad to provide them. 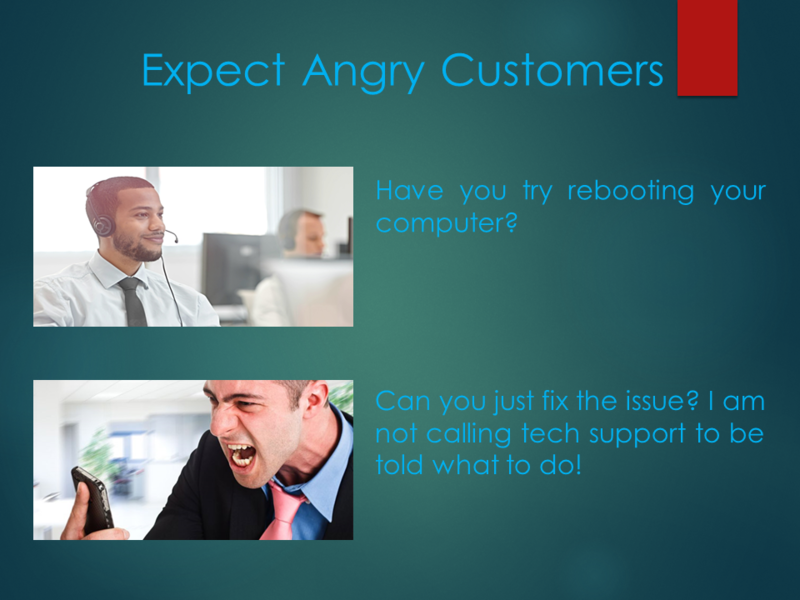 When you work in a customer support role, it is inevitable that you will encounter angry customers from time to time. Is the scenario shown on the screen sound familiar to you? We ask the customer a simple question, and the customer shout at us over the phone. No matter what we say, they just won’t listen. It is so hard to talk to a customer that is angry, and we (almost always) try to avoid this type of customer as much as possible. However, angry customers are like those lovely 1-stars. As we all know, no matter how hard you work or how good you are, 1-stars will come, and they come more than once. If you worry about talking to angry customers, or you have been intimidated by angry customers, this training is for you. In this training, we will talk about the theories behind anger, as well as techniques to deal with anger. First of all, we will need to understand how the brain works. So, how the brain works? 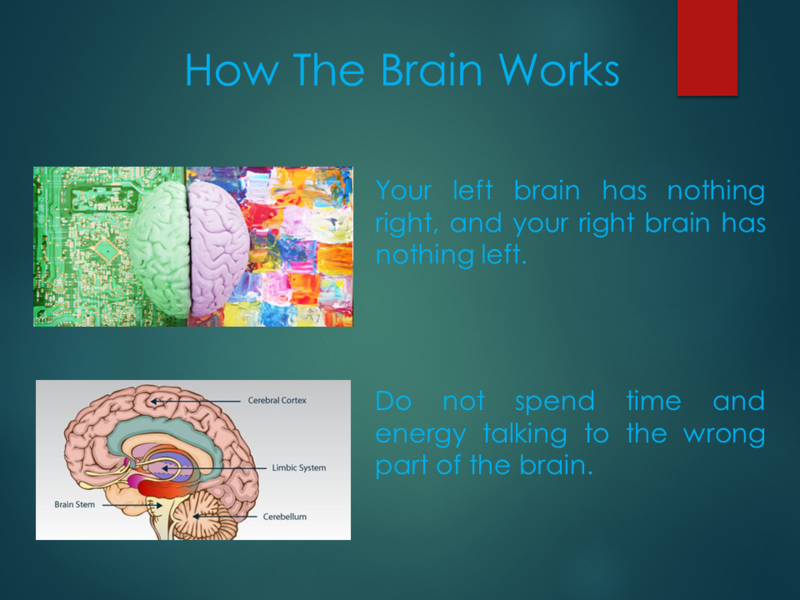 Most of us have been exposed to the left-brain and right brain theory to a certain degree. It is commonly believed that our left brain is responsible for rigorous reasoning such as science and mathematics (which is what we do), and our right brain is responsible for creativity such as art and entertainment (which is what we don’t do, at least during business hours). When the people we talk to stop reasoning, we tend to say that “your left brain has nothing right, and your right brain has nothing left”. But this does not explain why people get angry. Another theory divides our brain into four major parts the Cerebrum Cortex (or the Cortex), the Cerebellum, the Limbic System (or the Limbic), and the Brain Stem. The cortex is the largest part of the human brain, which is associated with higher brain functions such as thought and action. The cerebellum is also called the little brain, which is associated with regulation and coordination of movement, posture, and balance. The limbic system is often referred to as the “emotion brain”, which is responsible for human emotions. The brain stem is responsible for basic vital life functions such as breathing, heartbeat, and blood pressure. As we can see, different parts of our brain are responsible for different functions. The cortex for reasoning, the cerebellum for movements, the limbic for emotions, and the brain stem for life. It should be noted that the limbic system develops in an early stage during brain development, while the cortex develops much later. Therefore we also call the limbic system the old brain and the cortex the new brain. You can think of the brain as a computer with a single CPU core. The cortex system and the limbic system are two separate processes demanding CPU resources. In certain circumstances, a particular process gets executed with higher priority, reducing the amount of computing resources that is available to the other process. When this happens, the other process stops responding to external inputs. Under certain conditions, the old brain takes over and the new brain is shut down. At this point a person is taken over by his/her emotions, and loses his/her ability to reason. If you try to reason with him/her during this period, the conversation will be very difficult because you are talking to the wrong part of the brain. So, do not spend time and energy talking to the wrong part of the brain. Then the question becomes, why would a person lose his/her ability to reason? To answer this question, we need to understand how our body respond to danger. Assuming that you are hiking in the mountain, and suddenly a huge snake appear in front of you. Different people will respond to the snake differently, but all our responses can be categorized as flight (running away), fight (ha! ho! ), freeze (petrified, can’t move at all), and faint (ah ou). These coping mechanisms were developed over the evolution process, and have become the fundamental survival function of all animals. When being confronted with a danger, we act out of instinct instead of reasoning. 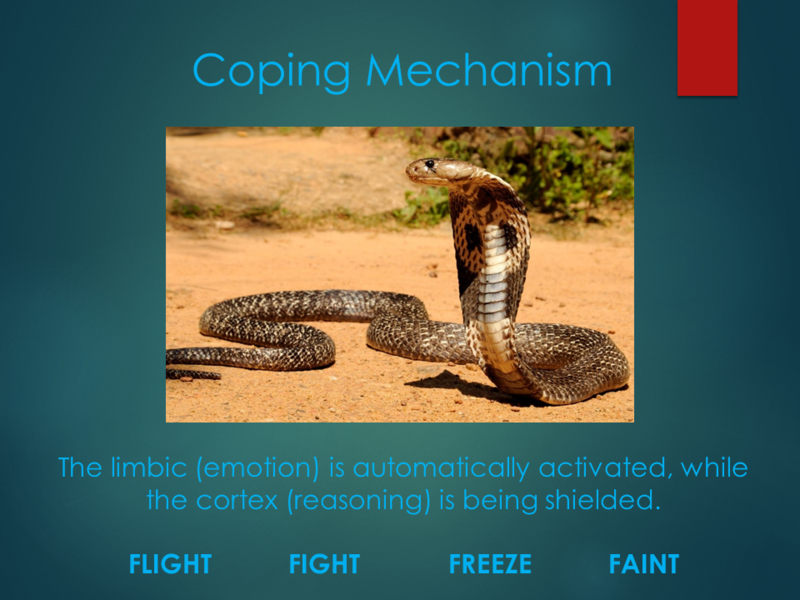 The limbic system takes over to cop with the danger. The cortex shuts down to keep you survive. If you want to study what snake that is, how big it is, whether it is a native or a foreign species, you do that only when you are out of the danger, not when you are in the danger. Now assuming that our customer is running a mission critical application on our platform. Suddenly their application stops working. In each and every minute, our customer is losing user, losing customers, facing critics, while the competitors are catching up. Our customer is in a real danger, and the coping mechanism is in action. Now, the limbic system takes over, while the cortex shuts down. If you try to reason at this point, you are talking to the wrong part of the brain. If we have to express this in technical terms, Mr. Customer’s brain is now experiencing a kernel panic, which is caused by a stack-overflow in the limbic system. In such circumstance, it is very important to understand that the customer is not targeting you as a support engineer. No matter what the customer says, you need to keep calm, and don’t take it personal. Let’s repeat three times – don’t take it personal, don’t take it personal, don’t take it personal. If there is anything I want you to take away from this training, it is “don’t take it personal”. 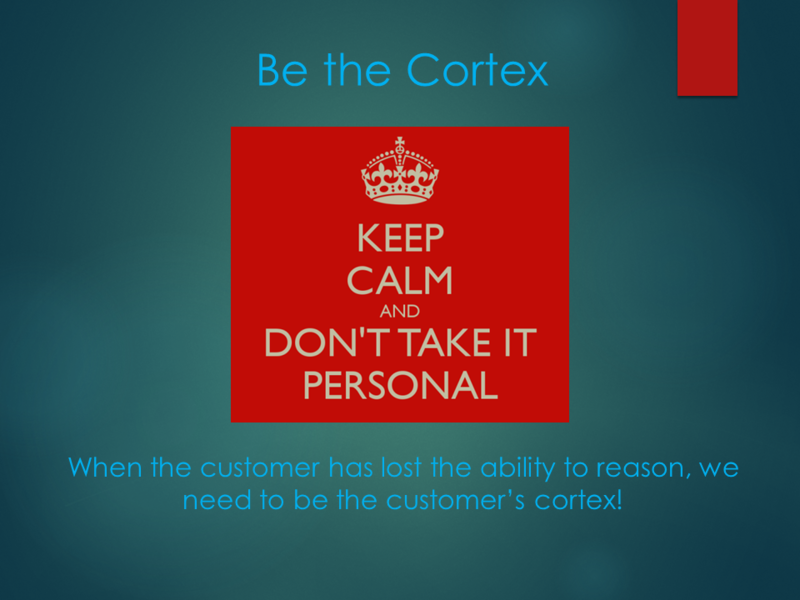 When the customer has lost the ability to reason, we need to be the customer’s cortex! But how? And how long will the customer regain the ability to reason? To answer this question, we need to understand the difference between primary emotions and secondary emotions. 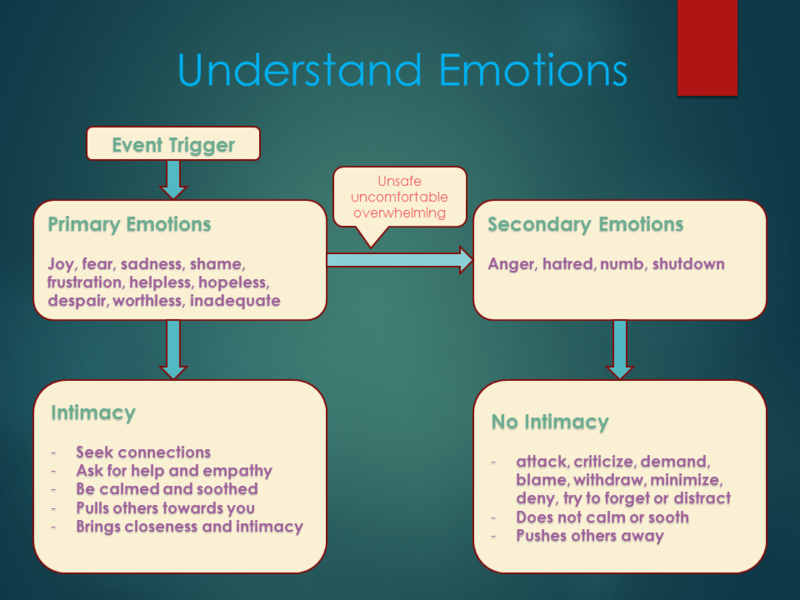 Primary emotions are those that we feel first, as a first response to a trigger. For example, we feel fear when we are threatened, we feel sadness when we hear of a death. These are the instinctive responses that we have without going through the thinking process. Secondary emotions, on the other hand, appear after primary emotions. They usually come from a complex chain of thinking process. More importantly, secondary emotion arises when the primary emotion is overwhelming, makes us uncomfortable or vulnerable. For example, when we are threatened by somebody, we feel fear. However, the feeling of fear makes me uncomfortable, makes me feel that I am a coward. Since I don’t won’t to be seen as a coward, I feel anger. Another example is that I ask my manager for a raise but my manager refuses it. I feel frustrated, but I am not able to change anything. The feeling of frustration makes me uncomfortable, but I don’t want to be uncomfortable. Then I might become angry, or numb, or shut down. Primary emotions are the result of instinct and do not consume much computing power. Secondary emotions are the result of very complex reasoning processes, which demand a lot of computing power. Therefore, when we experience secondary emotions, the emotion part of the brain takes control (gets higher priority), while the reasoning part of the brain shuts down (gets lower priority). Reasoning becomes difficult because we are talking to the wrong part of the brain. When we experience primary emotions, we seek connections, and we pull others towards us. When we experience secondary emotions, we attack and criticize others, and we push others away. Now we understand that anger is a secondary emotion. 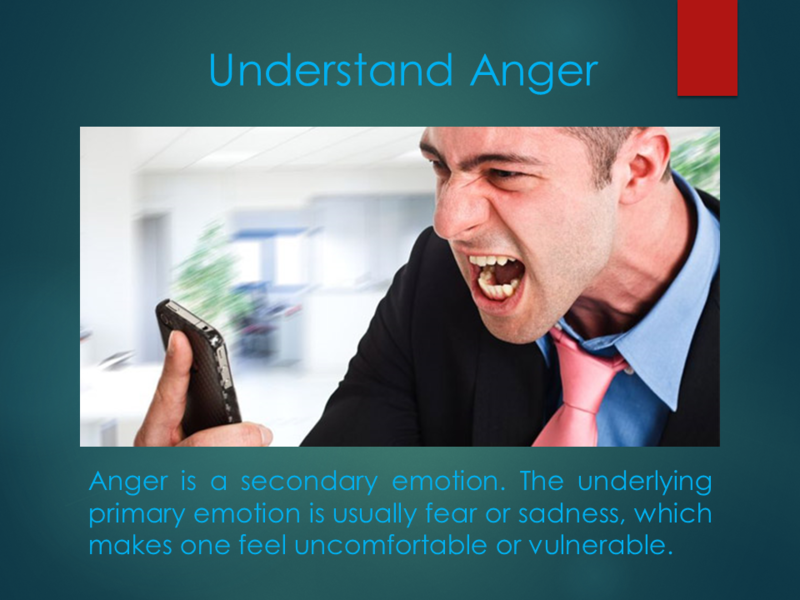 The underlying primary emotion for anger is usually fear or sadness, which makes one feel uncomfortable or vulnerable. Again, let’s assume that our customer is running a mission critical application on our platform. Suddenly their application stops working. In each and every minute, our customer is losing user, losing customers, facing critics, while the competitors are catching up. Our customer is in a real danger, and the coping mechanism begins to take action. Now, our customer feels frustrated that his mission critical application is down. He feels fear about the consequence – his boss might shout at him, he might receive a lot of complains from his team members, in the worst case he might lose his job. The frustration and fear he is experiencing make him feel uncomfortable and vulnerable. When such feeling becomes overwhelming, he feels a real danger approaching, and his brain automatically switches to “Flight and Fight” mode. The emotion part of the brain takes control, and the reasoning part of the brain shuts down. As a result, he becomes angry and begins to blame and criticize. As we just said, anger is a secondary emotion. It pushes others away, and makes the communication difficult. In this case, it is time for us to provide some emotion coaching to our customer. 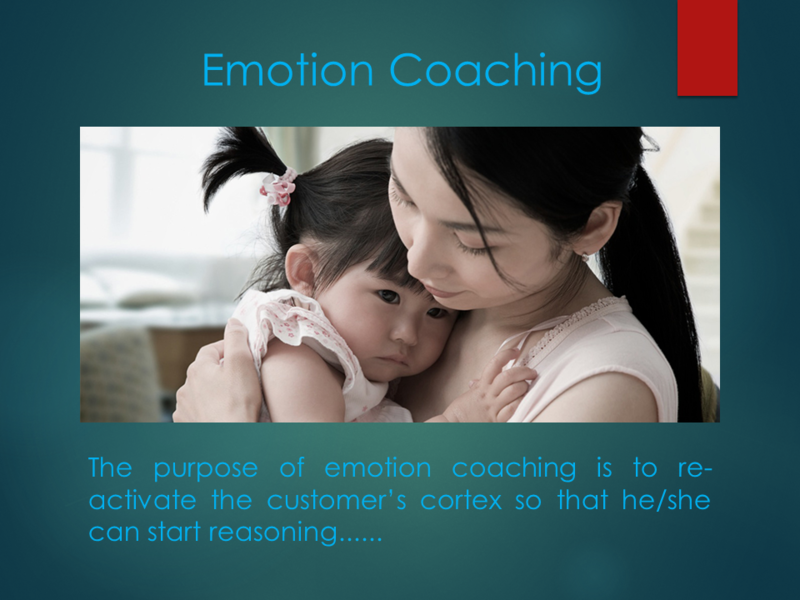 The purpose of emotion coaching is to reactivate the customer’s cortex (the reasoning part of the brain) so that he/she can start reasoning again. We do this by leading the customer from his secondary emotions back to his primary emotions. As we discussed just now, when people experiences primary emotion, he seeks connections and is open for help. We may think that this is a very complicate process. In fact, there are only several simple steps that we need to follow. And, it does not take long for an adult to calm down if the appropriate steps are taken. Listen to the customer patiently, and wait for the customer to stop talking. During this process, you can use “yeah… ah… right…” as simple acknowledgements. However, do not make any comments. You might think that the customer wants the problem to be solved as soon as possible. This is the wrong perception. For the customer, at this point his/her primary need is TO BE HEARD. 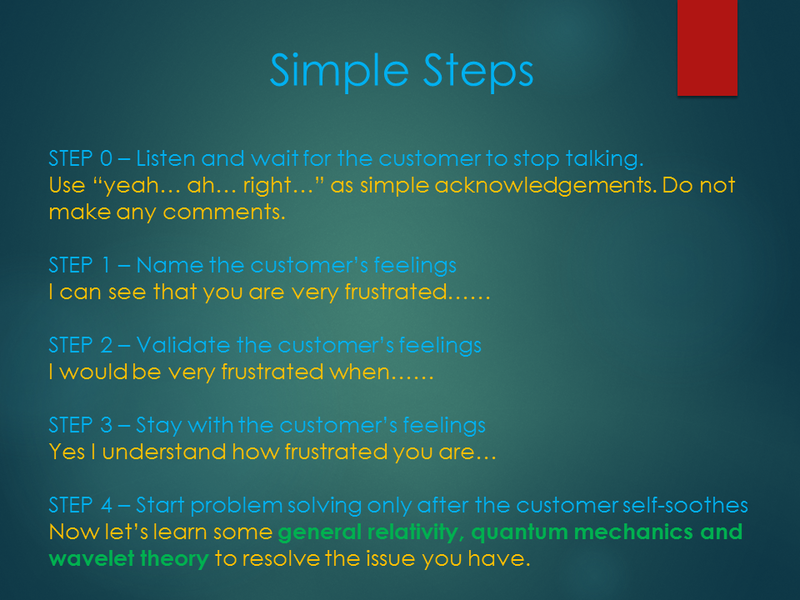 After the customer slows down / finishes talking, the first step is to name the customer’s feelings, using the names of primary emotions. For example, we can say “I can see that you are very frustrated / sad / disappointed when XYZ happens”. When we name the primary emotions, we guide the customer back to his primary emotions. Do not point out that the customer is angry, or tell the customer to calm down. This would make the customer feel shameful, which is uncomfortable for the customer. When the customer does not want to feel shameful, it is very likely that he would choose to convert this uncomfortable feeling into secondary emotions, which is going to be anger. The second step is to validate the customer’s feelings. When a customer experiences a thread, or a lost, he has all the rights to feel sad, or disappointed, or frustrated. There is nothing wrong with such feelings, and we need to allow our customer to fully experience and express such feelings. By allowing our customer to experience and express such feelings, the customer feels that he is being listened to. Such practice builds trust, and brings intimacy between us and the customer. It opens the door for future communications. Do not worry about the time you spend on naming and validating the customer’s feelings. It does not take long for an adult to calm down if the appropriate steps are taken. Therefore, continue to stay with the customer’s feelings when needed. You may want to repeat the previous steps when necessary. It is very unlikely that a customer would refuse your empathy. At some point, the customer will sooth himself and calm down. The reasoning part of his brain comes back and take control. At this point, it is time to teach our customer some general relativity, quantum mechanics and wavelet theory to resolve whatever issue he has. When communicating with the customer, use the “I” statement as much as possible. When you use an “I” statement, you take responsibility, and avoid criticizing the customer. In the case that a customer made a mistake, avoid using “you” or “your” in your statement. For example, “user ABC did something” is a better wording are compared to “Your user ABC did something”. When we did something that caused the issue, you can use “your resource” to take responsibility and acknowledge the customer’s lost. 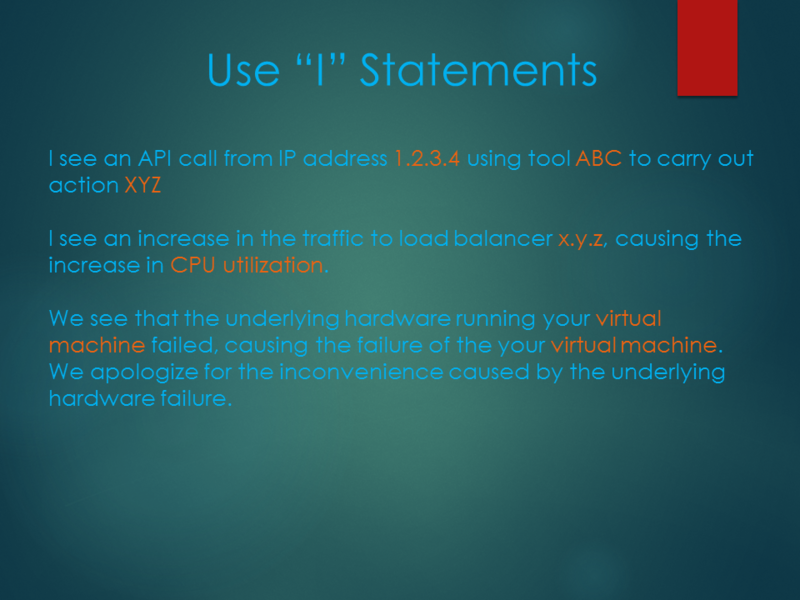 For example, “the underlying hardware running your virtual machine instance failed”.